Unique décor, picturesque views, balcony, a heavenly escape for up 5! NOTE BEFORE YOU BOOK: Visit 02 Seafront Apartment Dubrovnik Chic Rentals for up-to-date calenders, pictures, video tour and recent guests reviews. We're available for any additional information. As local experts, we are happy to provide any guidance to make sure it is the right place for your holidays! “O2” is a beautifully decored two-bedroom apartment with balcony, breathtaking views and private parking. It is located on Ploce which is one of the most desirable locations in Dubrovnik. It is a pleasant 10-minute walk to Banje beach and to the Old Town. The apartment has magnificent views overlooking the historic city walls, the Island of Lokrum and the infinity of the crystal blue Adriatic Sea. The apartment has been renovated in a stunning contemporary style mixed with fabulous interior design. “ 02 ” apartment is perfect for a group of friends or a family looking for a comfortable and inviting place within walking distance to the wonderful attractions of the Old Town, but just a little removed for relaxation. The apartment is situated on the 2nd and top floor of a residential building, close to 5-star Hotel Argentina. The interiors are stylish and contemporary, decorated in shades of white and silver, with tiled floors and white walls. The splash of lively colors (violet and lavender) awake your senses. “02” can accommodate up to 5 guests. The light and bright living area has large windows with sliding doors to welcome in its outstanding views and provide access to the covered outdoor balcony, complete with outdoor dining furniture. The living room is furnished with a large sofa, flat screen, and satellite TV, DVD and CD player. There is a dining area which has a large contemporary seating for 6. The dining area leads to the fully equipped designed kitchen, including fridge/freezer, 4-ring ceramic hob, oven, microwave, dishwasher, coffee machine, toaster, etc. The kitchen leads outdoors. The balcony with its spectacular views is an ideal spot for dining al fresco and is a perfect place to chill out with a glass of wine. Due to the elevated position of the apartment, you can enjoy the gentle cooling breeze throughout the summer nights. The bedrooms have been decorated in the same style as the rest of the apartment, using same colour and designed white furniture giving the apartment a perfect harmony. The main bedroom has a double bed (160x200), wardrobe, safe and has sea views. The second bedroom has a bunk bed for two (90 x200), wardrobe and a desk. The top range Italian bathroom comes with walk in shower, hydro-massage jet and wash machine. Towards the back of the apartment you will stumble upon multiple surprises; a rustic style veranda with stone walls with chimney and a dining table for 6. There is a sofa that can be used as an extra bed for 2 and A/C. The apartment features WI-FI access, A/C throughout and its has its own private parking space. About us: Dubrovnik Chic Rentals is run by French-Croatian couple Isabelle and Viktor. Quite simply, we love Dubrovnik! And we've used this passion to pour our time and energy into finding and managing the most charming, stylish and characterful accommodation on offer. Our Approach: We only choose holiday apartments and villas that we would stay in ourselves. So when we visit a potential rental property, we look at its location and the quality of its furnishings, fittings and décor to make sure they meet our own high standards. From your first enquiry through to the end of your holiday, you can be sure of an efficient, professional and cost-effective service of the highest standard. We want you to have a great holiday and to come back to stay with us again! 02 Apartment boasts an enviable location, a pleasant 7-10 minutes walk from Old Town and Banje beach. With its spectacular views and its immaculate modern interiors, 02 apartment offers a luxury retreat, yet not far from where action is! 02 apartment is perfect for a seaside holiday or a city break. Dubrovnik finest' attractions are all within walking distance from the apartment. There is a private car parking for the guests, but a car is not necessary during your stay. At 02, you'll spend most of your time relaxing and enjoying the magical views onto the sea, Lokrum island and the majestic city walls. The top range Italian bathroom comes with walk in shower, hydro-massage jet, hairdryer, and wash machine. We will provide you with our guidebook containing practical information and personal recommendations to make the best of your stay in beautiful Dubrovnik! We loved that apartment! It was spacious, modern, very well decorated, comfortable and quiet. It was near Old town of Dubrovnik as well as Banje beach. We have not use our car during our stay in Dubrovnik because every attraction was easy to walk and the supermarket was on our way between Old Town and the apartment. The outstanding view from the balcony is a good reason to choose this apartment because we had really nice moments dining and relaxing there with that breathtaking sightseeing. 02 boasts one of the most enviable position, a 5- minute walk to Banje and St Jakob beaches and a short stroll to Dubrovnik Old Town. A car is not necessary while staying in Dubrovnik. If you feel like to explore the region and you will hire a car, the apartment has its own parking. 02 apartment boasts amazing views although, there are 72 stairs ( 40- steps outdoors and 32- steps indoors) from the road to the main door. The extra effort is worthwhile! Price includes taxes, W-FI access, parking, linen, towels and final cleaning. Save money by booking your stay with us directly! 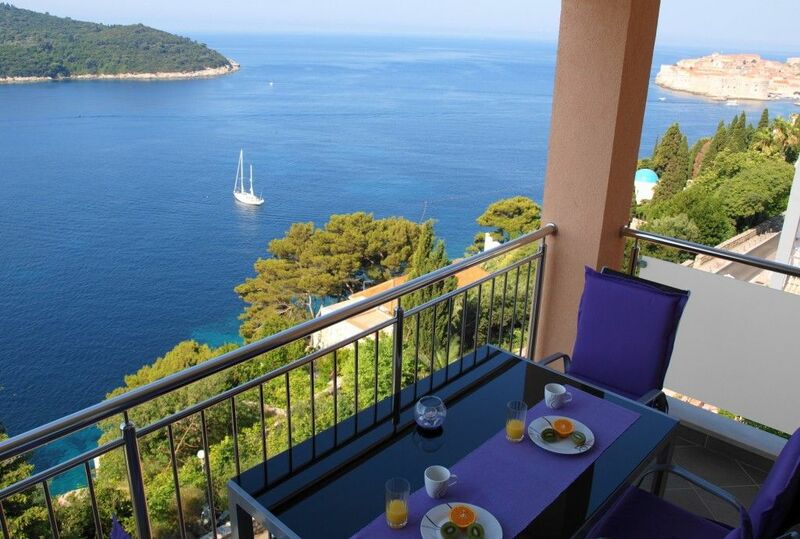 Visit Dubrovnik Chic Rentals 02 apartment for up-to-date calendars, pictures, video tour and recent guests reviews. We 're available for any additional information and advice. We're local experts and we want to make sure you book the right place for your holidays!